When famed Pamunkey leader Cockacoeske died in 1686, her successor as chief was a niece who might have been known as "Mrs. Betty, the Queen," according to a petition filed with the General Court in 1701. Pamunkey leaders sometimes changed their names in accordance with important contemporary events, so it is possible that Mrs. Betty became known as Ann (fl. 1706–1712) following the ascension of Queen Anne to the English throne in 1702. Much about her life is not known, but Ann did send a son to the Indian school at the College of William and Mary to be educated and also to serve as an English captive to guarantee the tribe's good behavior. As a Pamunkey weroansqua, or female chief, Ann worked to uphold Indian rights in the face of increasing pressure from the English colonists. Her name appears on several documents between 1706 and 1712, petitioning Virginia's colonial government to confirm Pamunkey ownership of tribal lands and pushing leaders to prohibit white settlers from encroaching on these lands in violation of established treaties. Ann sought to reduce the annual Indian tribute to the English, which had become more difficult as settlers' incursions reduced Pamunkey access to fish and game. She also requested that Indian youth employed beyond tribal lands be returned to their people and that colonists refrain from selling liquor in Pamunkey towns, a practice that had caused indebtedness among some Indians. 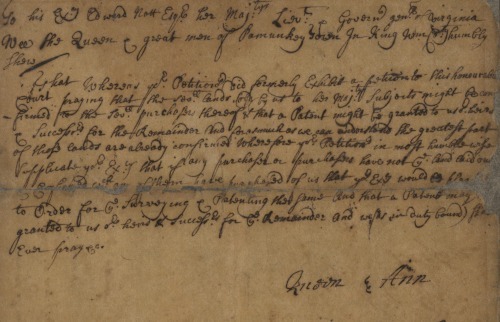 Ann does not appear by name in any extant documents after 1712 and is thought to have died about 1723. “Ann,” Virginia Changemakers, accessed April 21, 2019, http://edu.lva.virginia.gov/changemakers/items/show/359.